Electrolysis of water is the splitting of water into oxygen and hydrogen by an electric current that flows through the water. A fuel cell works by a reverse process by which hydrogen and oxygen combine to make water and as a result electricity is produced. At the anode the supplied fuel, hydrogen, is turned into a positively charged ion (a hydrogen molecule missing electrons) and a negatively charged electron. The electrolyte is a substance specifically designed so ions can pass through it, but the electrons cannot. The freed electrons travel form the anode to the cathode via a wire and the load (resistor / consumer). The ions travel through the electrolyte from the anode to the cathode. At the cathode, the ions are reunited with the electrons and the two react with oxygen (reactant) that comes from the air and water is created (fuel cells emit also heat). The anode, the positive terminal, is usually made of a platinum-coated material, the cathode, the negative terminal is often made up of nickel and the electrolyte in many cases is made from polymers but there are also other materials in use for electrolytes. There are different types of fuel cells but the electrolyte substance and operating temperature usually defines the type of a fuel cell. Hydrogen is the most common fuel to power fuel cells but hydrocarbons such as natural gas and alcohols like methanol are sometimes also used. There are also other chemicals possible in use for the reactant instead of oxygen. A fuel cells produces very small amounts of electricity, about 0.7 volts and low current output, therefore cells are placed (stacked) in series or in parallel to obtain higher voltage and current. A fuel cell differs from a battery in that that a battery has all of its chemicals stored inside, and it converts those chemicals into electricity. This means that as soon as those materials are depleted the battery runs out. On the other hand in a fuel cell chemicals constantly are supplied and it never goes dead and as long as chemicals are fed into the cell electricity is produced. Most fuel cells in use today use hydrogen and oxygen as chemicals but there are also other possibilities as mentioned above. Since fuel cells emit mainly water, heat and very low emissions of carbon dioxide and other pollutants it is obvious that their use benefit the environment. Main hydrogen sources today are coal and natural gas but if we are going to use fossil fuel electricity to produce hydrogen then the use of fuel cell technology is a waste of time in regard of environmental benefits. Only if renewable energy sources like solar and wind will be used to provide the energy needed to produce hydrogen the use of hydrogen energy will make sense. The term fuel cell was coined later in 1889 by Ludwig Mond and Charles Langer, who attempted to build the first practical device using air and industrial coal gas. In 1800 William Nicholson and Johann Ritter discovered water electrolysis independently by splitting water into hydrogen and oxygen by passing an electrical current through the water. In 1802 Humphry Davy had described a primitive fuel cell that used carbon fuel at the anode and aqueous nitric acid as reactant at the cathode. This device delivered a weak electric sensation. Davy didn't document his findings and as a result his invention was ignored by the scientific community. In 1838 Christian Friedrich Schönbein observed the fuel cell effect - the inverse electrolysis process - shortly before William Grove constructed his gaseous voltaic battery in 1839 based on Schönbein's ideas. 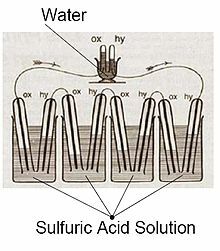 Both men used platinum electrodes and dilute sulfuric acid as a proton (positive hydrogen ion) conducting electrolyte not very different from materials used today in modern PEM fuel cells. Since Schönbein and Grove were close friends and exchanged scientific ideas regarding the inverse electrolysis process by letter, both of them should be credited with the invention of the fuel cell since their basic design based on the inverse electrolysis process of using hydrogen as fuel and oxygen as reactant is valid till today. However, Davy's achievement couldn't be totally ignored. Grove's gas battery didn't have much success because of the advent of cheap fossil fuels and the steam engine. William Grove's fuel cell - gaseous voltaic battery - from 1839. 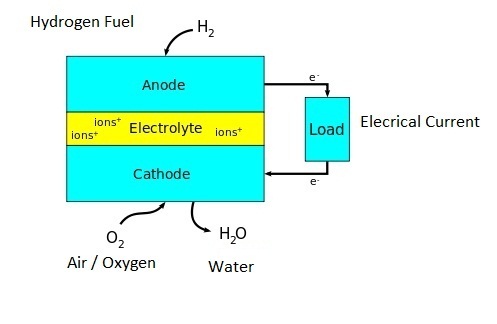 The lower part of this image consists four fuel cells that supply current to the electrolytic cell, placed above the fuel cells, in order to perform electrolysis of water. Grove's gas voltaic battery constructed in 1839 had electrodes (anode, cathode) made of platinum sitting in glass tubes with their lower end immersed in dilute sulfuric acid (electrolyte) and their upper part exposed to hydrogen and oxygen inside the tubes. The water emitted at the cathode end raised the level of liquid in both tubes and cell as the current flowed between the electrodes. Grove hypothesized that by combining several sets of these cells (since voltage and current were low) in a series circuit he might "to effect decomposition of water by means of its composition." In other words: the current produced in the fuel cell by creating water from hydrogen and oxygen will be used in an electrolysis process to decompose water. He created his gas voltaic battery and with his new invention, Grove proved his hypothesis and by the way built the first effective fuel cell (http://americanhistory.si.edu...). Take in account that you are going to need more than four cells to do electrolysis. In 1842 Grove constructed a gas battery with 50 cells and found that he needed at least 26 cells to perform electrolysis of water. The water fuel cell is a purported free energy device invented by American Stanley Allen Meyer. He claimed that an automobile equipped with the device could use water as fuel instead of gasoline. At the first stage the water fuel cell splits water into hydrogen and oxygen by electrolysis. Then the hydrogen fuel is used to power, what Meyer termed, a fuel cell water capacitor to generate energy used to power the automobile. According to Meyer, the device requires less input energy to perform electrolysis than the energy output. If the device workes as specified, it would violate both the first and second laws of thermodynamics and the law of conservation of energy allowing operation as a perpetual motion machine. Meyer's claims about his water fuel cell and the car that it powered were found to be fraudulent by an Ohio court in 1996. Stanley Meyer died suddenly on March 21, 1998 after dining at a restaurant. An autopsy report by the Franklin County, Ohio coroner concluded that Meyer had died of a cerebral aneurysm, but conspiracy theorists insist that he was poisoned to suppress the technology, and that oil companies and the United States government were involved in his death. We suggest an advanced project: Build, demonstrate and research the operation of a Stanley Meyer water fuel cell – is it for real? Stanley A. Meyer US5149407 patent from 1992 which claimed to produce more energy than it consumed.